more than the grim reaper. I deny reward until the deed is done. Last week I posted a day early, this week I'm a day late. It seems writing often takes a back seat to all of the other stuff that happens around me. I have no answer for this. Most mornings I habitually make my cup of coffee and sit at the computer. I read headlines, emails, new poems posted at various sites and I try to write something. I do have a journal which I semi faithfully enter thoughts. I say semi because by the end of the year about half the pages are empty. I'm pretty faithful January through March. but by April it is hit or miss, especially as the tax deadline approaches. Now there is life getting in the way, big time. The tax deadline always throws me off. I have an accountant who would like to get my records so he can work with them. There is something about the tax deadline that puts me in a funk. I'm self-employed, pay estimated quarterlies and always owe money in the end. I went to the doctor the other day and she asked why was my blood pressure so high? My only answer was, I had been working on my taxes just before coming to her. I've written poems about taxes, I use poetry as a reward for working on my taxes. I've also denied myself access to poetry until I've accomplished my tax tasks. Hence, I've fallen behind in my "poem a day" commitment for April and I'm a day late with my blog. 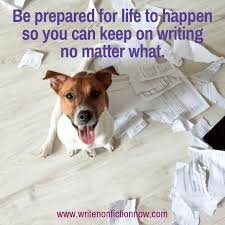 Taxes aren't the only stumbling block for not writing, life throws us all kinds of unexpected issues. My furnace conked out on me two days ago. I called for repair and was told it couldn't be repaired, he had to condemn it, it is one year beyond my warranty. Of course, the weather has been less than cooperative, luckily I can keep warm with my wood stove until I can get a new furnace. But building and maintaining a fire takes time and energy and I'm quickly diminishing my wood supply. Life has a way of doing these things. When distractions occur and they will, take a deep breath and trust you will work through them. One bite at a time. And along the way maybe write about them. I hope life's surprises are inspiring you. If you write about them, share with us.